Look no further, you found what you're looking for right here! 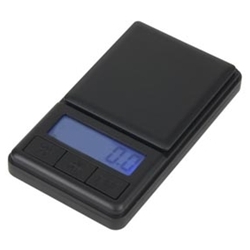 The "Excel" digital pocket scale from US Balance features a blue backlight and easy 3 button controls. Don't be fooled by this scale's diminutive size and low price, this precision instrument includes professional features normally found only on larger, much more expensive scales. The Excel from US Balance is an ideal, all-in-one unit. -Overall Size: 3.8" x 2.2" x 0.6"
-Platform Size: 2.2" x 2.0"
- Easy 3 button Use: Mode, Tare and Power!